The race for Hessich Oldendorff is on! From Splitman, vintage vw collector and SCC-speaker extraordinaire, we just got this garage-photo. 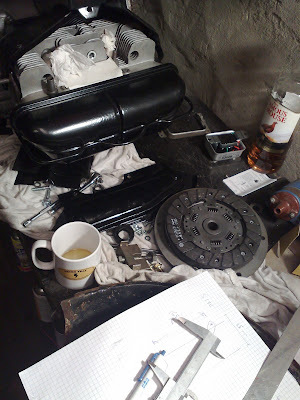 These days he is busy working on the powerplant for his pre-Ancient classic, making it ready to fly low on the autobahn next summer. Jasså ja! Så det er sterkere saker som fortæres mens du er ute i garasjen mens jeg legger ungene.